An experiment with another recent module acquisition: a spectral filter. It’s like my previous filterbank, the one that this rainbow-colored module (from the 4MS Company) replaced, in that it divides the incoming audio signal across the spectrum and helps you focus in on one narrow band or sliver of that sound, but it has many additional superpowers I’m only just beginning to learn. 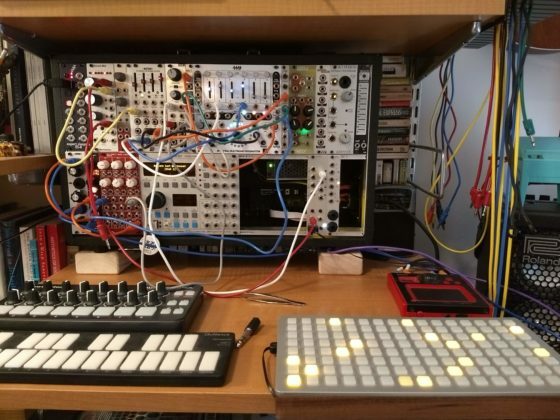 Heard here is a little melody produced by the sequencer, the Monome Grid in the foreground, which is directing the notes played by a triangle wave via a module called Ansible. A trigger module (the Trigger Man) is setting the pace of the Grid, and also correlating some short sharp square waves from an LFO (the Batumi module) that are, in turn, creating little blips in the triangle wave (emanating from a Dixie II oscillator). The three main things this has that the Instagram didn’t have are: (1) the rhythm from the Trigger Man is a little more complex now, giving the melody a bit more of a herky-jerky beat; (2) the melody itself has some randomization going on (more like probability: will a note play or will it not); and (3) there’s a heavily subdued version of the audio that plays at the open and close (it’s running through a low-pass filter). There’s a bit of noise in this recording, and I’m not sure why.